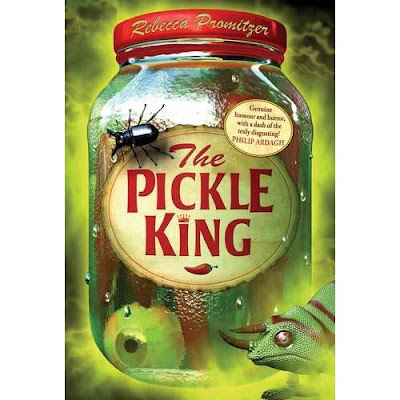 Another great debut author from Chicken House in the way of Rebecca Promitzer with her book "The Pickle King." It's a fantastic but unusual read with lots of interesting ideas. I found it very original (an aspect of story writing that is getting harder to find in a book). The setting is in a small town called Elbow where it rains alot - a bit like in Yorkshire! The main characters include five misfit kids and one mad dog. The book encompasses a real-life dead body; a missing eyeball and bag of intestines. These unusual ingredients add up to create a red-hot adventure that grip you from page to page. Especially when you include the dark and chilling moments that give an extra dimension to the book. Plus the jar of Herman's Devil Tongue chili, one crazy hospital full of mad people and a pinch of mystery and that just about sums up this book. All in all a super book and well worth a read. Four out of Five for a book that offers something different to the reader. really good book some creepy parts overall BRILIANT!